Assists in forming friend and family relationships and developing individual personality. Brings about a healthy love and self-acceptance in that it promotes the right to love and be loved in a noncompetitive manner. In removing the intolerance of ourselves or others a loving balance can be achieved. Prehnite has a rhombic crystal system, is in the mineral class of group silicates and considered to be in the Zeolites family. It has a 'hot water' origin and is generally the first crystal in a trapped lining of rock. Not discovered until the end of the eighteenth century, this was the first stone to be named after its discoverer. Major Prehn brought back samples from the Cape of Good Hope near South Africa. Prehnite can be found world-wide. The ones I carry are coming from the Mumbai District in Brazil. Generally in its crystal on matrix form, it's coloring would appear to be almost colorless, opaque white or yellow, or pale to a darker green. 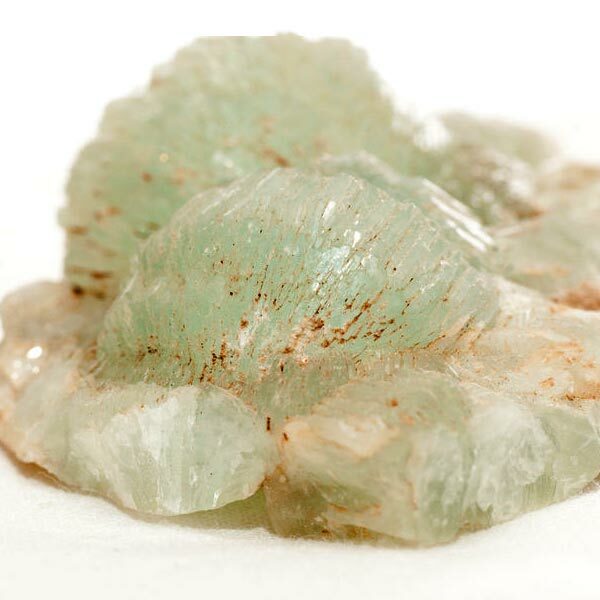 Generally it is found crystallized in compact masses rather than large individual crystal masses, so I was tickled that they found a vein large enough to produce in tumbled form and in a nice minty green color. Prehnite needs to be used over very long periods of time. Skin contact will speed its effects. In my own explorations, I found it took a month of having it near me before realizing some of its benefits. Prehnite assists us in dissolving our avoidance and substitution mechanisms. It allows us to accept unpleasant truths which can be an aid in understanding our own identities. 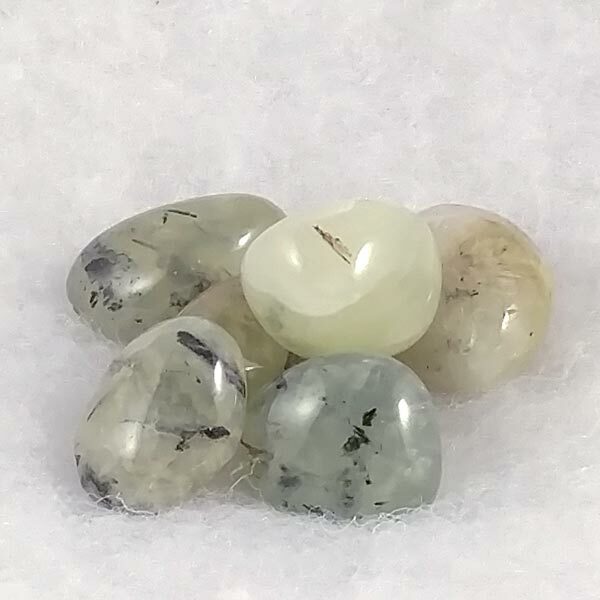 Prehnite lets us look at avoided images and memories and aids in dissolving the unpleasant feelings that are connected with them. It does not bring up the memories out of the blue, but it helps us to work them through when they have been triggered by some new experience. Prehnite encourages our analytical thinking and can speed up the process of sensory perception. The increases in this area are not perceptively noticeable but a gradual process made aware to the concious mind when needed. I have found it to be a great mental organizer when working through a project. Things seem to naturally fall into order making it easier to follow through on plans taking the necessary steps in the order they are needed. Prehnite stimulates the metabolism of fat and accelerates the removal of the toxins it stores. It is quite beneficial in stimulating all regeneration processes in the body. BUT, don't expect over night results. This stones energy is slow and steady and not in the express lane. Prehnite has a special affinity with Virgo. It has a Receptive Energy, it's Element is Earth, and its Planet is Venus. Prehnite is being used in our modern times to multiply energy and to enhance ones protective fields. It has also been quite beneficial as an aid in remembering dreams. It can help to enhance prophetic abilities. It brings very precise and accurate knowledge, however, this inner knowing seems to only be revealed when the concerns are for your own spiritual growth. Many refer to this one as a 'scout' stone. The knowing that it brings allows for always being prepared in advance of the situations when they occur. While this knowing is generally not at the conscious level, when 'things' happen, we know what needs doing.